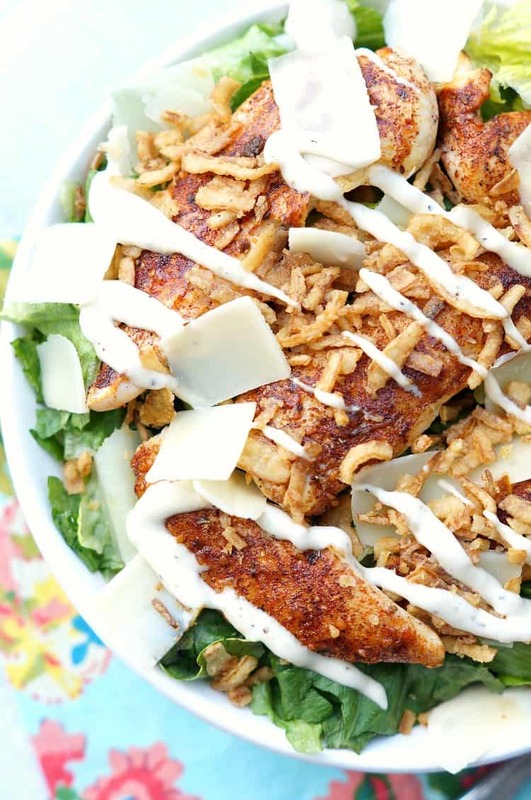 Blackened Chicken Caesar Salad with Crispy Onions is a modern and delicious twist on the classic Caesar salad! Hi everyone! 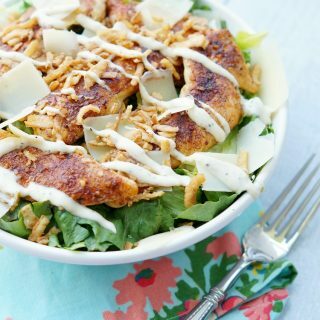 Amanda here from Old House to New Home sharing one of my favorite salad recipes! 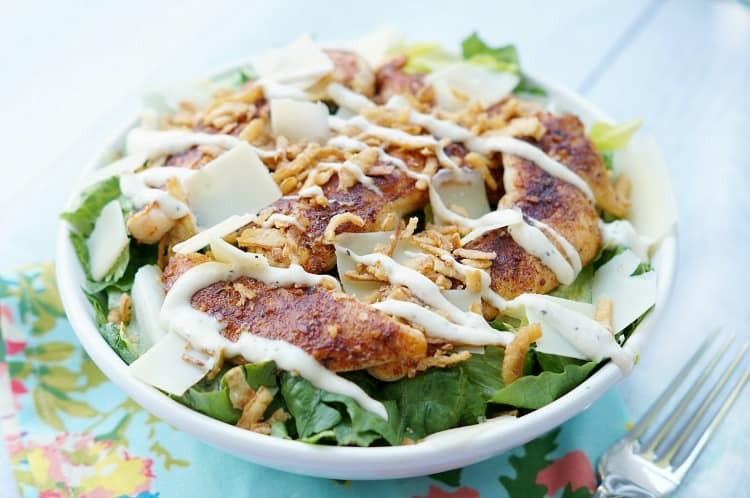 I am always partial to a caesar salad over a regular salad, but when you had delicious blackened chicken and replace the croutons with crispy onions, the humble caesar salad becomes extraordinary. 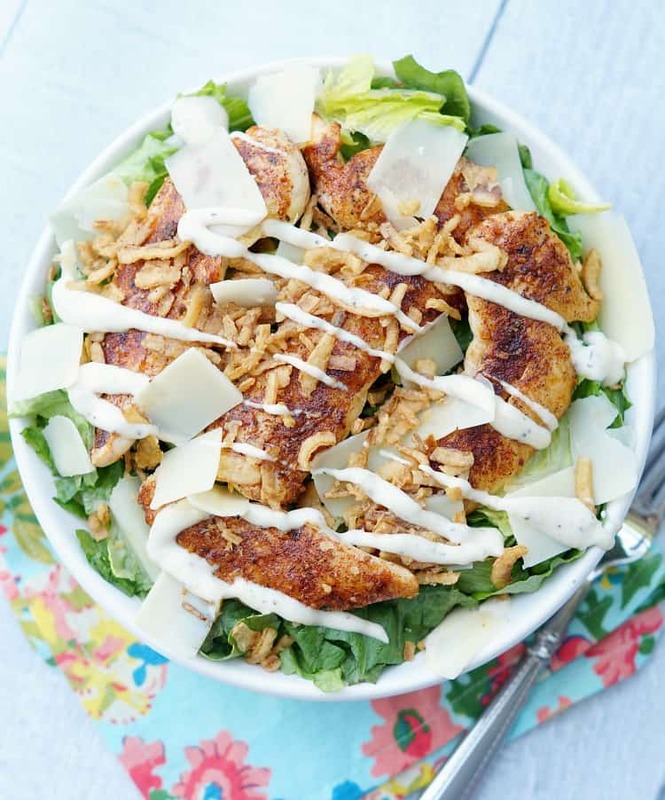 I don’t often eat salads as a meal, but I could eat this kicked up caesar salad any day of the week! With summer coming, it is time to switch out some of the heavy comfort meals and replace them with lighter meals. Salads are always a spring and summer go to, but admittedly, I am not the biggest fan. I don’t mind salads, but I don’t often order them at restaurants or make them at home. I am much more a juicy steak or big bowl of pasta kind of girl! 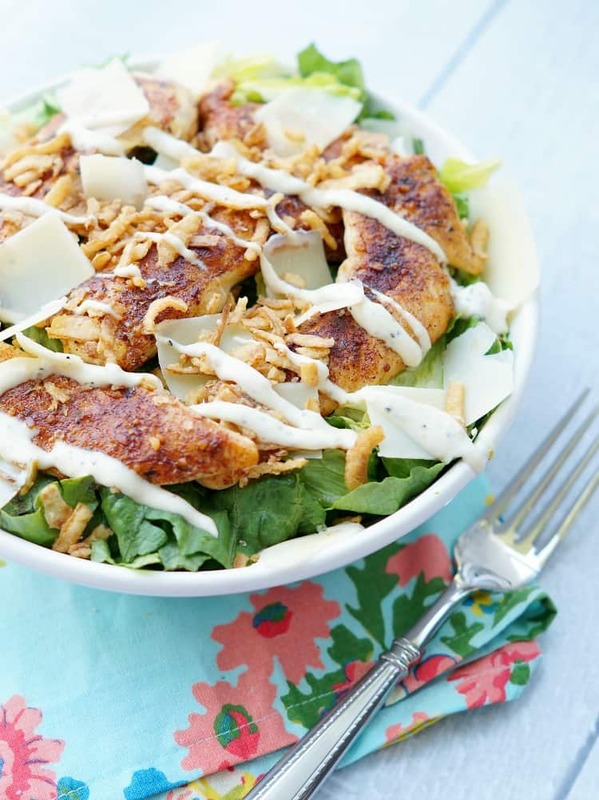 But…I made these blackened chicken caesar salads a few months back and now I am hooked! Blackening seasoning is so flavorful and one of my favorite ways to season chicken! It isn’t spicy, so much as smoky, and adds such a great taste to a regular plain old chicken breast. This chicken tastes delicious on the grill and if you are lucky enough to live somewhere warm enough to get grilling, I recommend throwing these blackened chicken pieces on the grill! 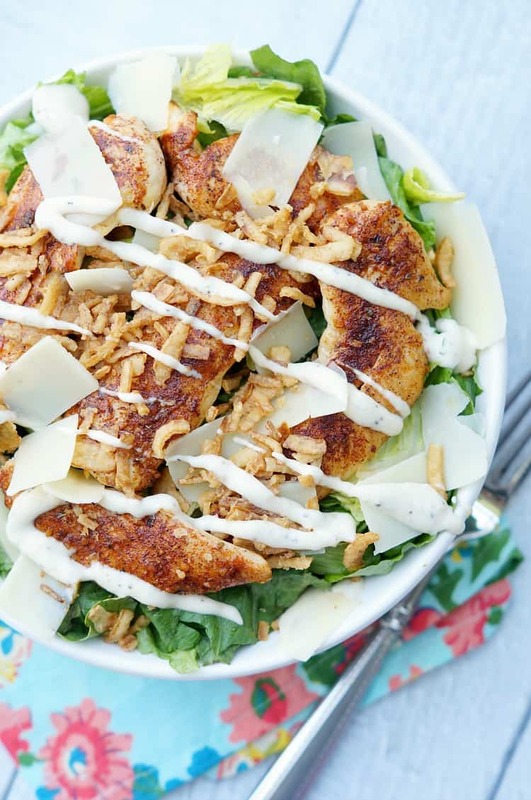 I put a fun twist on this salad by replacing the croutons with crispy fried onions. 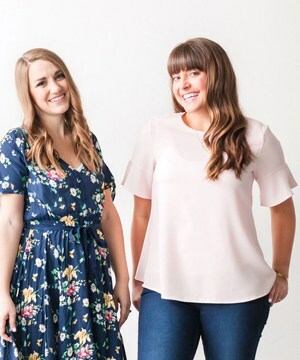 You know the ones that you have once a year on Thanksgiving on your green bean casserole? They are delicious in this salad! You also want to use a nice wedge of parmesan for this salad. Since there aren’t many ingredients, you want them all to be high quality. I love to shave my parmesan wedge with a vegetable peeler to get nice long slices! With summer right around the corner, it is definitely salad season! 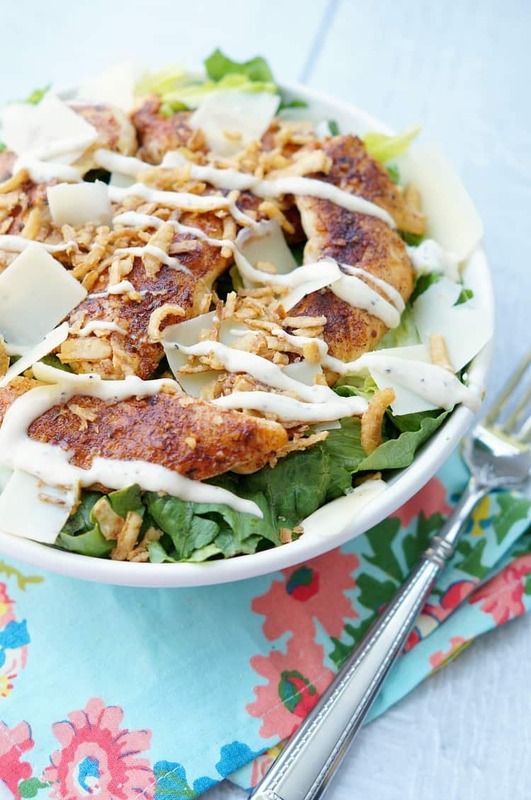 There is no better way to welcome the weather than with this salad!